Host president, Argentina’s Mauricio Macri, said the solution was “dialogue, dialogue and dialogue” and called for a clear message of shared responsibility. But US President Donald Trump has already cancelled meeting Russia’s Vladimir Putin over Ukraine. The G20, made up of 19 of the world’s most industrialised nations plus the EU, accounts for 85% of the world’s economic output and two-thirds of the world’s population. Its meetings, which began in 2008, are an opportunity for members to develop global policies tackling major issues – but many of the key decisions will be made in one-on-one encounters. There is massive security for the summit in Buenos Aires, with a bank holiday declared for Friday and the city’s main business district shut down. What have the opening exchanges told us? The world leaders were all called on to the stage and assumed their position for the traditional family photograph. Saudi Crown Prince Mohammed bin Salman stood on the outside of the photo, far away from Turkey’s Recep Tayyip Erdogan. This is the crown prince’s first major diplomatic test since the murder in Turkey of Saudi journalist Jamal Khashoggi, a key critic of the government. Saudi Arabia has blamed “rogue agents” but suspicion has fallen on the prince for ordering the killing. After the photo was taken, the crown prince did manage a hearty exchange with Mr Putin. French President Emmanuel Macron held a five-minute exchange with the crown prince during which, a French official said, Mr Macron had conveyed “very firm” messages over the Khashoggi affair. Mr Trump had a “friendly meeting” with the crown prince, Saudi media said, while UK PM Theresa May has also said she will meet him. Mrs May held a 15-minute meeting to discuss trade with Mr Macri. Their two nations have long disputed sovereignty of the Falkland Islands. Mr Macri’s opening address to the summit admitted there would be issues of disagreement that needed to be managed. He called for consensus on sustainable development, the future of work, food supply, climate change and international trade, adding: “I am an optimist”. What will go on on the sidelines? There are certain to be plenty of bilateral, trilateral or even larger get-togethers, although the one that will not be taking place is the highest-profile. 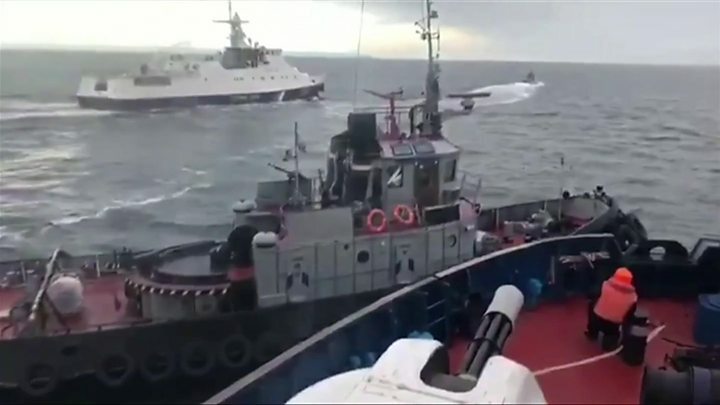 Mr Trump said he would not meet Mr Putin because three Ukrainian vessels and 24 sailors seized by Russia in the Black Sea near Crimea had not been returned. “We don’t like what happened. Nobody does,” he said on Friday. German Chancellor Angela Merkel has blamed the crisis “entirely” on Russia and said she would raise the issue with Mr Putin. The second-highest profile meeting will also involve Mr Trump. He will have dinner on Saturday with his Chinese counterpart, Xi Jinping. The key issue there will be the nations’ trade tariffs dispute. The US has hit a total of $250bn (£196bn) of Chinese goods with tariffs since July, and China has retaliated by imposing duties on $110bn of US products. China said consensus was increasing on a deal but that differences remained. Mr Putin has also weighed in, with a thinly veiled attack on Mr Trump’s America First policy. The Russian president condemned “dishonest competition” along with “vicious” sanctions and protectionist measures. The Brics group, comprising Brazil, Russia, India, China and South Africa, issued a statement saying protectionism ran counter to the “spirit and rules of the World Trade Organization”. Ahead of the summit’s official start Mr Trump signed a trade deal with the Mexican and Canadian leaders. Mr Trump described the US-Mexico-Canada Agreement (USMCA) – which replaces the Nafta free trade deal – as “probably the greatest trade deal ever”. “All of our countries will benefit greatly,” he said. Will there be a joint G20 communiqué? European diplomats told Associated Press there has been tough haggling over a final statement. Argentine officials indicated differences on trade could be overcome. However, that will still leave the obstacle of climate change. Mr Trump has not hidden his objection to collective action on the issue. UN chief Antonio Guterres said in Buenos Aires that “this is a make-it-or-break-it moment” on the issue. French President Emmanuel Macron was quoted by AFP news agency as saying he would refuse to sign a trade deal with South America’s Mercosur bloc if Brazilian President-elect Jair Bolsonaro withdrew from the Paris climate accord.